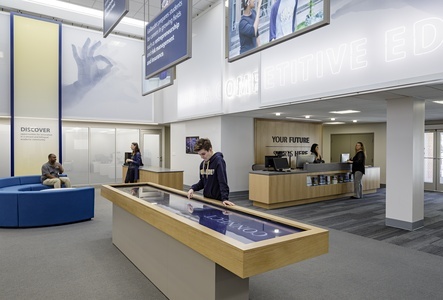 The state-of-the-art, multimedia-enhanced visitor experience is the centerpiece of the Maguire Welcome Center at Gallaudet University (GU), a premier institution for the deaf and hard-of-hearing. For the project, C&G Partners immersed themselves in the culture of the deaf community. 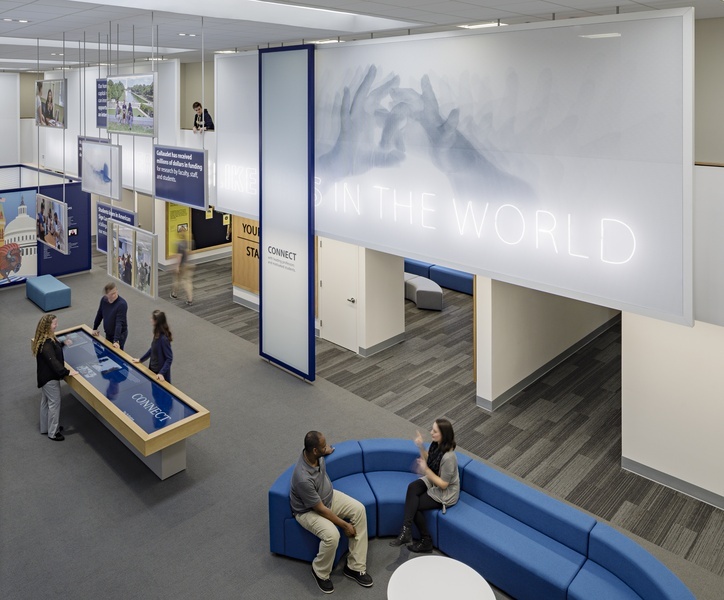 Designs were based on the DeafSpace Guidelines, established by the executive director of Campus Design Hansel Bauman, that include more than 150 distinct design elements that address the major touch points between deaf experiences and the built environment. 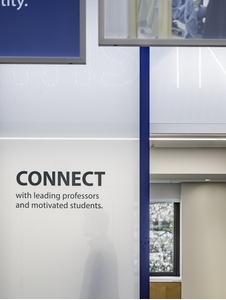 The project also included unique artworks that portray the GU tagline—Welcome, Connect, Discover, and Influence—in American Sign Language (ASL). To create the graphic artworks, numerous hand movements used to sign the tagline were individually photographed, masked and overlaid to create single images that represent the movement at the heart of sign language. These images were printed on scrims in a variety of sizes to ensure optimum legibility and visibility. 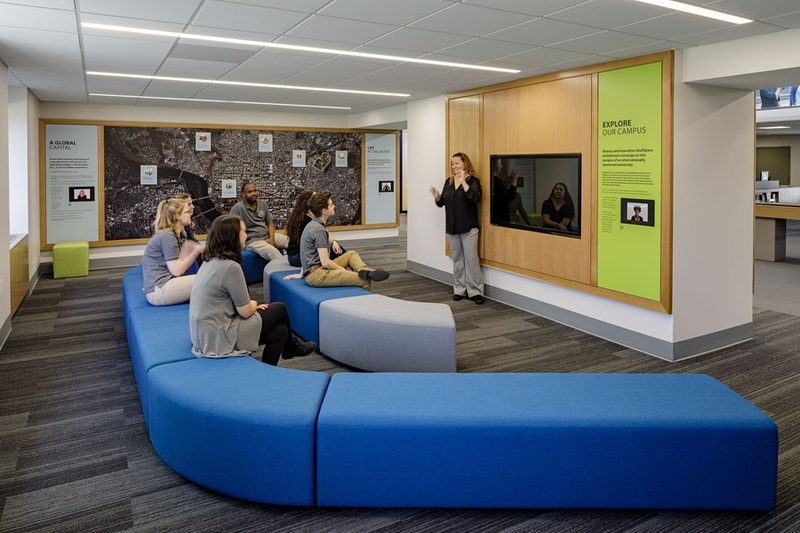 According to the DeafSpace principles, a soft, diffused light “attuned to deaf eyes” is essential. For similar reasons, C&G Partners illustrated GU’s branded slogans through large decorative, neon friezes. 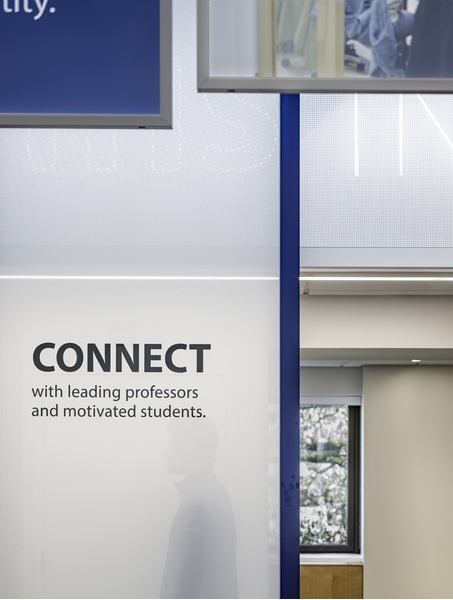 A double-sided lightbox installation, foregrounding GU communications material, is also suspended from the ceiling in the form of an informational chandelier. All design elements, including other exhibition features such as an interactive table, map, iPads, and banners were created with a focus on inclusivity, accessibility, and creating a barrier-free space for shared experiences. 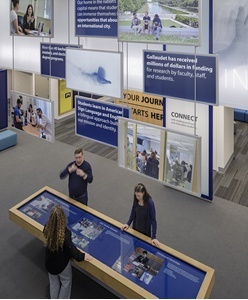 C&G Partners was also responsible for designing the signage for the welcome center.